Has anyone attempted setting up a race with sailing canoes? I guess the biggest difficulty is that most of the canoes are different in design, setup and sail area, so the 50 sq/ft purpose built sailing canoe is more likely to win a race over the home-made open canoe with a 25 sq/ft rig. Allocating a sensible handicap to each type of canoe must be the first obstacle before any proper sailing can be done. Is this something people would be interested in doing? My thoughts on handicaps would mainly be based on sail area. I.e. (25 sq/ft or less), (26 sq/ft to 35 sq/ft), (36 sq/ft to 44 sq/ft), (45 sq/ft to 60 sq/ft), (61 sq/ft & over) etc. I also feel that there should be a rudderless/ paddle steering category. In lightish winds the paddle stroke canoe would be a huge advantage, yet in strong winds, a rudderless canoe would be a big disadvantage, so instead of having a handicap, they would race against similar canoes. Having some form of racing would hone sailing skills, improve canoe setup to improve performance and add another dimension to a sailing meet, other than just bimbling around together. Is there a general interest in this? We in the OCSG have raced our sailing canoes quite a bit over the last 20 odd years - a little race or two was quite the norm on the Sunday morning of our meets in the past and we still do it sometimes if there is the interest from those attending. We have occasionally had enough participants in different boats/rigs to feature separate classes but the vast majority of the time we race under one "class" - limited to 44 sq ft. This figure was chosen as it mirrors the size used by other countries, particularly in America (although we found that their measuring system is not the same as the rest of the sail-racing world, but that's another story). We don't start races in more than a F4 to keep it from getting silly and too tough for the less experienced. We used to have rules as to what constitutes a "canoe" with regard to shape, decking etc but went away from such complications for simplicity and to avoid discouraging design innovation, especially for homebuilt boats. A variation of the 44 sq ft rule for the last few years has been to allow an extra small amount of sail area for canoes with two people rather than just one. This was to allow partners to stay involved in our primarily social, fun meets rather than be sidelined during a race, given the extra weight in the canoe means a disadvantage, especially in light winds. An extra 14 sq ft was chosen as it is the typical size of many mizzen sails as well as being the extra area provided by the larger of the bermudan rigs offered by Solway Dory. In practice this has been quite successful and provided fairly even racing performance, as far as we can tell given so many other variables. Regarding the issues of paddle vs rudder steering you could end up with so many categories there might not be sufficient numbers involved in each to make it viable. We have discussed the idea of racing using all the different modes that a canoe can employ such as sail, paddle, portage, poling, lining etc but never made it happen. What we do sometimes is have sailing/paddling races with a lap or two of each mode. This is as much to encourage and practice rigging and derigging on the water as the paddling technique/fitness of those racing. I've sometimes done those races using just the rig, leeboard and a paddle ie no rudder and won against ruddered boats - so rudders are not always better. Back in the earlier history of canoe sailing there have been "upset races" where as well as sailing a course you have to capsize and recover at some specified point - the definition of a capsize being that the mast head in its normal position has to touch the water. We've also done pursuit races with the better sailors from an earlier race setting off after the others - in reverse order at say 30 second or a minute intervals - to provide closer sailing so the less experienced can be amongst the more experienced to copy and learn from them. We've also done some treasure hunt/score-orienteering type events where sailing or paddling is allowed - great fun but they need significant preparation on someone's part. I'm usually up for a race and grab any opportunity to race in mixed class dinghy events whenever I can - using a Portsmouth number of 1300 as we seem to perform similarly to Topper and Mirrors. Our event at Netley Sailing Club on Southampton Water at the end of the month may well include racing with their dinghy fleet on the Sunday for those so inclined - can you make it there? Thanks for the comprehensive reply Keith. In every canoe sailing meet I have attended, someone/ a few people have been in a canoe without a rudder. Greg has been to a few with me and as Greg has demonstrated, been able to use his paddle for propulsion as well as using it to steer with. In the calm conditions of Rutland Water earlier this year, he was out performing canoes with 44-sq/ft, yet he was only using a 35 sq/ft rig like myself. On Hickling Broad it was force 4 or 5 conditions and it was clear that I was able to make much better progress than him (Before I capsized of course! Lol) so assigning a handicap to a canoe that wants to use a paddle for propulsion/ steering would be impossible as it comes down to strength and differing wind conditions as to whether they have the advantage or disadvantage. Stipulating that the limit should be no higher than 44 sq/ft (Plus extra if there is a crew) is fine, but it doesn't really cater for people with less sail area. Take myself & Richard. I have a 35 sq/ft rig and he has a 25 sq/ft rig. It doesn't really interest me to go racing when I know that I am likely to come last or second last! I would like to think that based on handicap, I need to cross the line by at least 10-minutes to beat him and that if I can cross the line less than 15-minutes behind the race leader, I could actually win the whole race! I won a race in my old Enterprise once crossing the line 40-minutes after the Fireball that crossed it first. That's what you call racing! hi chris, the three rivers race in the norfolk broads looks good to me, boats sail up a river to a mark then back down and up the next river and down again and so on. The faster boats have to pass thought the slower ones it all gets quit interesting. With my interest in local groups in liverpool i think i have found a nice place on the weaver, i have only seen it on a map i need to check it out. It is over looked by a nice park so onlooker could picknick and whatch, a b.c.u licence is needed the lenth could be 4 to 5 hours the broads race lasts all day.It needs a place were two rivers meet so any place would be ok. I won a race in my old Enterprise once crossing the line 40-minutes after the Fireball that crossed it first. re the sail area issue, I suppose we could record times and then correct for sail area as a proportion/percentage or whatever would make it fair. Having a standard time to correct by would not take the length of the course/time taken into account. An excellent result Keith, well done. Sail number 9? Did you give your canoe a sail number then? Good to see a few Toppers & Enterprises up there in the top 10. You know what I'm talking about Keith, getting some kind of handicap set up to make it more competetive for the less capable canoes making the sport more inclusive. 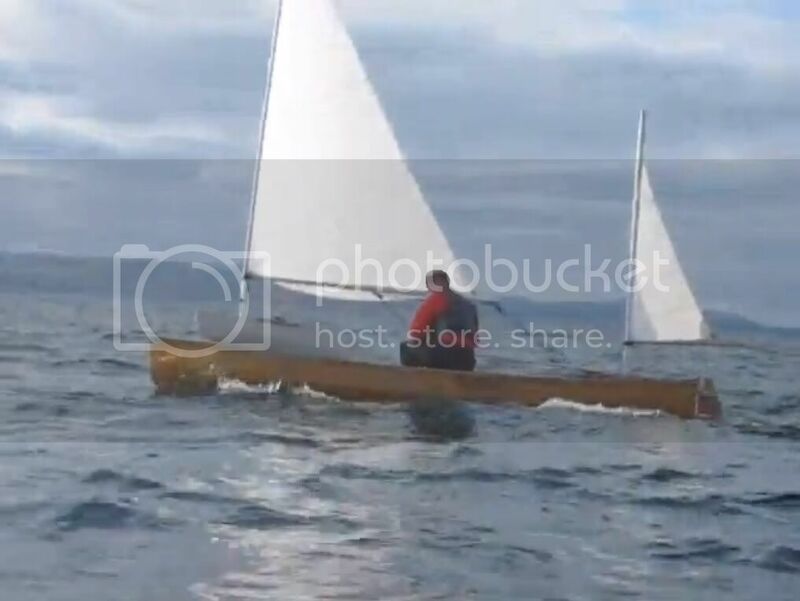 I don't think it needs to be exact and yes some rough calculations based on how much wind the sails can grab and after this, it's tough luck if you have a heavy canoe (Like me) or a lug sail that won't point as well as a Bermudan. It just means that my race tactics, skill and judgment have to be sharper to compete with a lighter more sophisticate craft using a similar size sail to me. In fairness this is how dinghy racing is anyway. My wooden Ent has the same handicap as a GRP Ent, yet it is lighter and slightly more buoyant. The down side is that it doesn't have any self bailers unlike the newer GRP Ent's and should we both capsize at the same time, I can forget it, because they will sail themselves dry, while I am still bailing!! Perhaps there is already a formular for calculating the handicap based on sail area. In reality, I know much more goes into it and the Portsmouth calculations probably do time trials to establish hull efficiency, drag, turning speed etc. but something simple to get us started is possibly all we need. Last weekend I found myself once again slipping into race mode, silently trying to get upwind ahead of a rather nice Miracle dinghy. It made me realise that it is only a matter of time before I have enough confidence to want to start doing some racing in my Ranger (Sail number still to be confirmed - Perhaps I should ask Dave how many 35 sq/ft Expedition Rigs were sold before mine! ), but racing against 44 & 50 sq/ft Shearwaters with no handicap difference, doesn't inspire me in the slightest. I used to race on the Denver Sluice just outside Kings Lynn. It is little more than a 2-mile stretch of canal 40-foot wide and most Sunday's around 25-dinghies of all shapes and sizes go head to head. Pretty much any place will do, except canoes need a little more space to turn, so a canal would be the last choice I guess. Living in East Anglia/ the East Midlands means I am spoiled for places to sail and race, so location is not really a problem. For me the issue is having the ability to compete against sailing canoes with bigger sailing rigs. The OCSG have been issuing the OC insignias and sail numbers for over 20 years - I think we're up to about 150. Portsmouth numbers are determined from "averaging" hundreds of results over the years from club racing - that's why some are provisional for newer classes whilst others are well established, such as your Enterprise and Toppers, Mirrors etc. Last edited by windorpaddle; 2nd-September-2011 at 11:25 AM. 3 rivers is by invitation and you have to apply for and invitation ( if that makes sense) i think also you have to have a certain class of boat. Sorry to put in a spanner. I don't know what I want but I want it now! Cool, has 150 been taken yet? Bagsy that number pleeeeeeeeeeeeeeease. Okay Keith, how can we devise some kind of Portsmouth handicap numbers based on sail area alone and call them the OCSG handicap numbers instead, but try to make them similar to the Portsmouth numbers should we mix it up in dinghy racing. It sounds like we already have 1300 for 44 sq/ft sailing canoes so maybe a 35 sq/ft rig should have a similar handicap to an Optimist at 1646. These also have 35 sq/ft rigs though they are lighter, but less streamlined. I have tried to find something with a smaller rig to represent the 25 sq/ft rigs, but have not yet managed to find anything. Am I on the right track do you think? Thanks Phil & Jay. I think the location of where to race is something that can come later. Getting some form of fair handicap in place to make it fair for people to race against each other in differing canoes is the first hurdle I feel. Another question that I am am struggling with is the course scale. What I don't know is how to calculate the scale of a course. Is this done on the day or is it calculated for each course once and then used all the time? Last edited by Steamerpoint; 2nd-September-2011 at 10:48 PM. Number 150 has already been taken I think - but you would have to check with Ellen who looks after the numbers thing. You could email her thro the website - or details on the membership list if you have that. We have used a PN of 1300 for rigs of 5 sq m (about 53 sq ft) so for 44 sq ft the PN would need to be a bit more. Actually another hurdle is that of whether there is enough interest in racing - many people take up with open canoes because they are not into competition and many are actively disinterested - preferring the wild places, aesthetic pleasures of tripping etc. Hmm... yes I see your point. I guess if it was possible to agree a PN for various sail sizes & we could work out how to calculate the Scale of a course, then all that needs to happen during a meet is a simple question "Would you like to take part in a little race this afternoon and if so, pop your name on the list and state your overall sail area". Someone stays on the bank with a bell or air horn to start the race and record the finish times and jobs a good un. If only 3 or 4 people fancy a race, that's fine. It's just a bit of fun at the end of the day and more will join in once they get bitten by the racing bug. I certainly agree that taking part in racing makes you a better sailor, and that having the skills to make the boat move efficiently can be very useful on trips. The OCSG self assessed 'star tests' include finishing a race in no more than 133% of the winners time as one of the targets for those who wish to prove to themselves that they have intermediate level skills. The 35 sq ft Expedition Rigs have proved to be popular, and are increasingly becoming the way into canoe sailing for many. It would be nice if the folks joining the sport with Expedition Rigs could join in with canoe sailors with larger rigs on trips and expeditions. Seeing as my enthusiasm for racing is based on a desire to raise the level at which we all sail, I have a question mark in my mind about having a handicap system for people with small sails. My point being that in the real world, if a boat is 20% slower, that can make the difference between everyone getting to the island in the light, and everyone arriving in the dark. 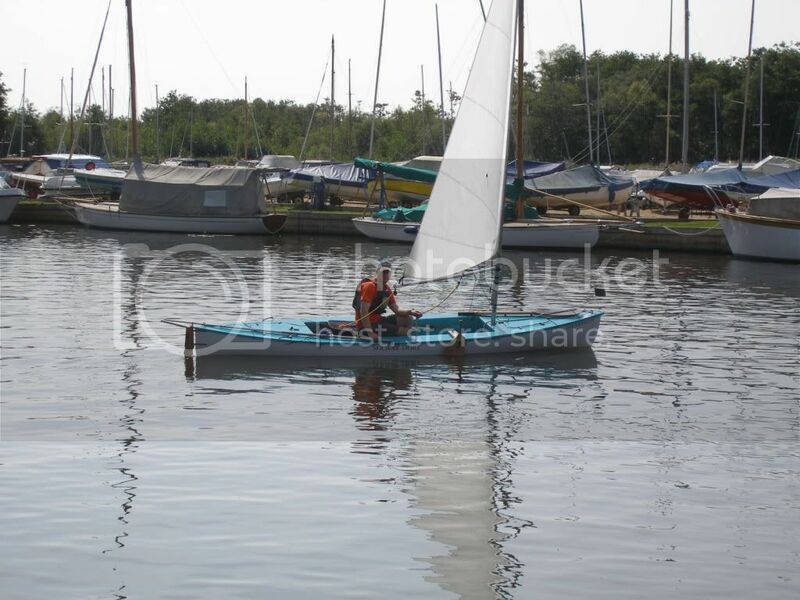 The 35 sq ft sails tend to appeal to people from a paddling background, so we could try out the idea of a 35 sq ft class where sailors were allowed to paddle as well as sail. It would be really interesting to see which class got round the course first, and how different conditions affected the results. I can forsee some technical problems with starting both 44 sq ft and 35 sq ft classes simultaneously, but we could work those out. All of the above is just a point of view, and it is not even a view that I hold strongly. I don't mind if people want to get their calculators out and work out a time bonus for those with smaller sails. my enthusiasm for racing is based on a desire to raise the level at which we all sail [...] in the real world, if a boat is 20% slower, that can make the difference between everyone getting to the island in the light, and everyone arriving in the dark [...] so we could try out the idea of a 35 sq ft class where sailors were allowed to paddle as well as sail. It would be really interesting to see which class got round the course first, and how different conditions affected the results. From a cruising point of view... paddle sailing with even a small expedition rig seems to be fair alternative for going upwind or across the wind: my little Flashfire with a reefed 25 square foot sail seemed to be well matched to assorted other sailing canoes when we beat up towards Tighnabruaich in a force 5+ last weekend, and outperformed the big sailing canoes (all unreefed) when we crossed the sound in a light breeze... and I'm pretty sure my Jensen 18 with a 35 square foot expedition rig would do the same. My slight concern on a cruising front would be the the long runs with a strong following wind: paddling doesn't add to the apparent wind when heading downwind... so efficiency isn't improved... but to be honest, we're looking at a situation in which I'd expect everyone to be moving pretty quickly! I like Steve's idea very much, as racing definitely improves your ability to get good boat speed, especially upwind. Paddle sailing with a small rig can even out the differences in performance over a larger rig, and in lighter wind it will be superior. Sailing downwind, the difference in performance between large and small rigs is not so pronounced. As a bigger rig produces more boat speed, it will reduce the apparent wind which it feels, so the difference in boat speed with different sized rigs will be less. Personally, I quickly realized that paddle sailing wasn't for me, hence the reason I upgraded my canoe into a sailing canoe, so entering a race where first across the line was the winner competing against canoes with 44 sq ft rigs or canoes that were being paddled directly into the wind, would be of little interest to me. I have sailed alongside 44 sq ft rigs and they have left me behind!! Only when they are reefed down, do I stand any chance, but then we would have similar sail areas anyway. 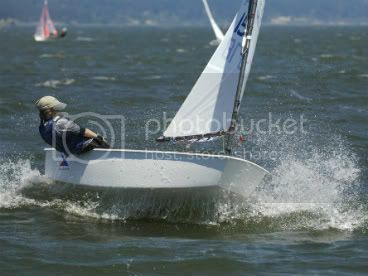 My attraction to sailing (And even gliding) is to pitch my skills against Mother Nature. Using a paddle for propulsion comes down to fitness, brute strength and technique, for which I have little, so would rather use my sailing experiences, skill and strategy to compete in a race. The handicap system was developed to make racing different sailing dinghies fair and inclusive They had to start with rough figures once upon a time and then hone them over time. They still amend these figures every year. It's not an exact science either. I have raced identical boats where one will sail better than another. Perhaps the rigging setup, a slight weight difference, better sails etc. but a 3% difference can be overcome with better skills & strategy. There is no way an Enterprise can compete with a Laser 3 and without the handicap system, there is little point even starting. I just feel that if we are going to have a little fun doing some racing, it needs to be fair and perhaps some form of handicap system should be started even if it turns out to be wrong and needs to be amended later on. For our diverse range of canoes and sail types and sizes, we could start with something simple, the sail area. Later points could be added or removed for certain types of canoes, those using outriggers, those with a ketch rig setup and so on, but these refinements could be years away. Last edited by Steamerpoint; 5th-September-2011 at 01:06 AM. I have sailed alongside 44 sq ft rigs and they have left me behind!! Does anyone know when you obtain a sail number, is it the boat/ canoe that is linked to the number or the rig? I'm fairly sure it's not the owner. My Enterprise Anona (Sail number 12252) built in 1967 has 12252 etched onto the centreboard, rudder, rear transom, sails and even the airbags, so this number is well and truly connected with the boat. I know from my military days that each dinghy had a number of sails (Training sails (Just old sails), cruising sails (Slightly better condition) and crisp racing sails) and each of these sails had the same number on them. This could indicate that the boat is registerd to that particular number, not the sails? Perhaps the boat and rig is matched to that number? In other words, any number on my Expedition rig sails would connect to my Ranger 16 with that rig, yet if I bought a Burmuden rig and fitted it to the same canoe, the Burmuden would need a different number? Yes? No? Any idea's? as far as i know the number is with the boat. like the registration number on your canoe..
but perhaps things are different in the uk. over here there are 2 different sailing numbers. you have 1 or the other. 1 is within the class of the boat. example all lasers. 2 is the international number that starts with ned and then 5 digits. that is for more fancy racing. The OCSG sail number belongs to the person, not the boat. This is used so that people can recognise each other on the water, or who is in what position in the race. The race referee is usually anyone left on the beach who is willing to start the race and time and place the finishers. This is often a wife who has come along for the first time and doesn't recognise the sailor or boat. Helen Broome makes and gives out sail numbers. There is a small fee, but i don't remember what this is. You should have her contact details, as a member. Lots of members do not have a sail number and as racing has been happening less recently, so it isn't as important, but they are still useful for recognising each other on the water. We do things a bit differently in the Open Canoe Sailing Group. Sail numbers stay with the member, not the boat. Of course this does cause the occasional problem when boats, with numbered sails, are sold to another OCSG member. But being a cheerful and resourceful bunch we work round this and many members don't bother with adding their number to their sail, or may not be interested in racing at all. When we get round to racing, at some but not all of our meets, we are serious enough to be fairly competitive with each other (and there is the odd prize involved) yet relaxed and good natured enough not to have protest meetings and all that malarky. We have proper racing starts and occasionally Le Mans style beach starts and also the odd race with a paddling leg. Times are recorded for posterity and publication in the Gossip. I'd like to do more racing next year and agree that racing is an excellent way of sharpening up sailing skills. I also rather like Oceanic's idea of experimenting with a separate paddle sailing class for 35 sq ft expedition rigs. It would be interesting to compare the relative speed of 44 sq ft sailors and 35 sq ft paddle sailors in a variety of wind strengths. Thanks for clearing this up for me. I have been in contact with Ellen and am going to get myself a sail number. She tells me that the stickers are a mere £10, which sounds great and would make it easier for me to take part in a few local races next year, which I enjoy, yet never win. It will also make it easier for my buddy to spot me on OCSG meets now that the Expedition rigs have taken off and there will be loads of them on the water next year. All of my Dinghies and most things I have sailed have had sail numbers and it feels a little alien to sail something without one. Like driving a car without a numberplate fitted. Plus, if I go for an OC sail number, it does more to advertise the OCSG and further promote open canoe sailing. 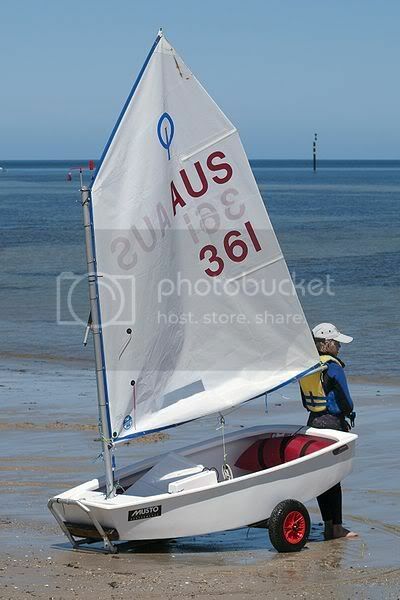 Just wonder why more OCSG members haven't got themselves a sail number yet? As I mentioned before - many people take up sailing with open canoes but are not into competition and many are actively disinterested in racing - preferring wild places, expeds etc. While not neccessary, does it not formalise the sport? To an outsider, does it not give the impression that the canoe sailor is part of something. Something with membership, training, licences and insurance rather than a canoe paddler who has made a home-made sail out of an old tent. In my early days in the military, before I could afford a car, I used to hitch hike home up the A1 at weekends. I quickly discovered that if I hitch hike in uniform I would always get a lift within minutes of putting my thumb out! Same kind of thing I feel. You'd might have more success in herding cats uphill in the rain than in persuading some OCSG members they should display numbers on their sails. I have OC 135 on two of my sails but OCSG members tend to be individualists and have their own ideas about what they will conform to, or not - a spirit I admire. However, I do agree standards and training are important. We seem to proceed best with a mixture of example, discussion, consensus and advice, and there's always someone willing to help with a question or offer advice when asked. An old tent? Now there's an idea for my next spinnaker. Seriously though, we are a generally well organised and responsible bunch, just not very good at being formal. Perhaps we ought to promote the sail number a bit more. Mentioning it on the website might be a start, and perhaps encouraging people in Gossip. I am OC71 and have had several sails with that number on. There might be a few others using them now as i sold them on. I am just having a new sail made for my new boat. Must order some more numbers. Yeah OK, you and Steamerpoint are right we should promote sail numbers a bit more. I'll order some more for my sails without them. Why bother having numbers put on the sails permanently? If racing is just an occasional part of a canoe sailing meet then why not just have detachable numbers you can stick on the canoe or better still on the backs of PFDs like marathon runners? Last edited by Jurassic; 14th-December-2011 at 07:23 PM. Hey Chris, what don't you like about sail numbers? When I see OC71 now, I will instantly recognise this as Dave S and head off in the opposite direction! (Only kidding Dave ) Would you have "Jurassic" on your sails? If so, I can see little difference. By the way, if any OCSG members want to email Ellen about getting themselves a free number allocated (£10 if you want stickers as well) send me a message and I'll reply with her email address. Don't want to post it publically. If your not an OCSG member, it only costs £20 for basic membership!! I just don't see any point. What purpose do they serve? For me none. If I'm close enough to read a sail number I'm close enough to recognise the canoe. I hear what you are saying Chris. Okay, I have put a photo below of someone you have met and as you can see, no sail number. Who is it? Here's another one Chris. When you arrive at the sailing club and you see a few boats sailing off, who's this? Again no sail number, but I am sure you recognise the boat. You're rather missing the point here: most of the time, most of us have no particular wish to be identifiable on the water - and some (perhaps many) will be quite averse to advertising that the "canoe sailor is part of something [...] with membership, training, licences and insurance". I'm conscious that sail numbers could be help the coastguard to establish a positive ID: to be sure that the canoe spotted departing point A was the same one spotted upside down at point B and was not the one spotted entering safe haven C. Combine that with an entry on the small ships register... and you're perhaps making life easier and increasing your chances. Is that what everyone will want to do? No - not everyone would even welcome such surveillance!!!! Hi Greg, you throw a different light on the subject and at the same time suggest that some people want to remain invisible to the authorities for some reason! I say the authorities, because my understanding is that anyone outside of the authorities is unlikey to obtain the personal details from the OCSG as to which person is using which sail number due to data protection. I then have to question why people would want to remain invisible to the authorities? This is a wider debate that perhaps is best not discussed on the forum, but over a beer sometime. Surfice to say however that having a sail number is optional and when racing, it is a good thing. As Dave has also said, it is handy on an OCSG meet to identify people when actually sailing, especially when red Expedition rigs and white Bermudan rigs are everywhere these days. First one is Jeff Broome in Njuzu, second one I think is Dave Poskitt in Steve Robinson's Shearwater. I actually cheated slightly and did some photoshop work on them. Below are the original photos so you can see who is really sailing the canoes. Using sail numbers in the OCSG is certainly not compulsory and if anyone doesnt want to use them then nobody will give you grief. When we used to race at nearly every meet then they were useful for recognising people but we have hardly had a race for the last couple of years. I still like to have one though as people can recognise what we are,and is therefore good for promoting canoe sailing. Interesting to see what they're sailing over the pond, it doesn't look wildly different to what's happening over here. I particularly enjoyed seeing the competitor steering with a paddle, I kinda miss paddle steering and am seriously considering converting my Pal back to that sort of minimalist set up. A nice video Zollen. They are sailing with a one design lateen rig. They were very popular in the early days of the OCSG as John Bull brought out his own version. They are not great for the conditions that we often have over this side of the pond as they do not reef and eventually gave way to Bermudans or Lugsails. I recognised Marion V. She and 5 other American sailors came over in 1996 and we had an International Race meet on Windermere. If i remember rightly we had about 35 entries for the racing.